A beautiful, hand cut heart keychain is a sweet way to remember a loved one who you have lost. 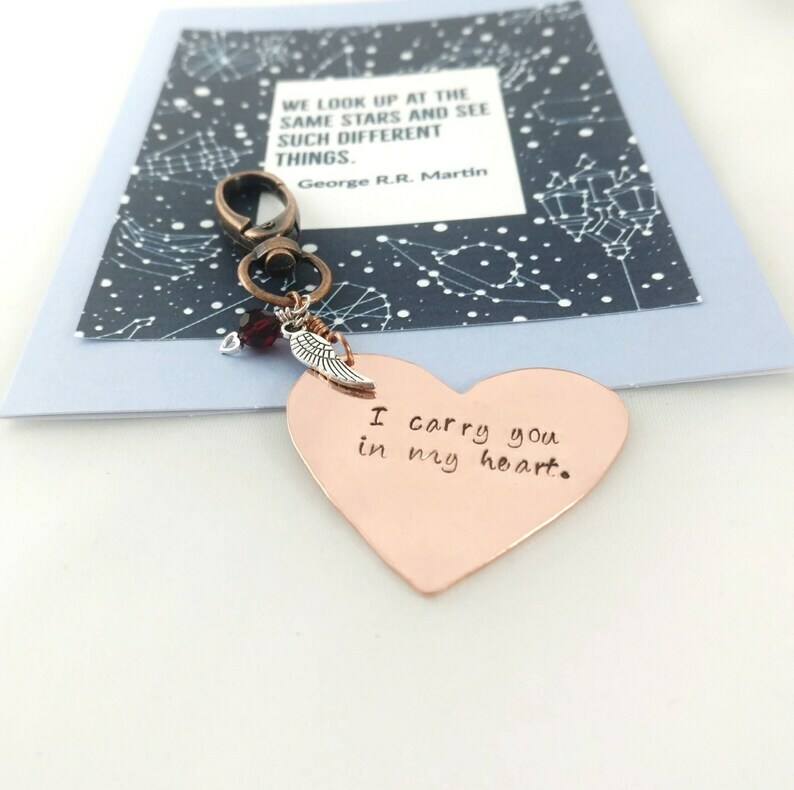 Each heart is hand stamped with "I carry you in my heart" and has your loved one's birthstone and a tiny angel wing charm. 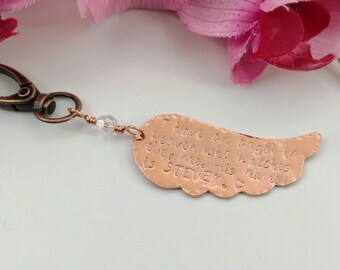 This keychain will make a memorable gift for someone who has experienced loss in their life. 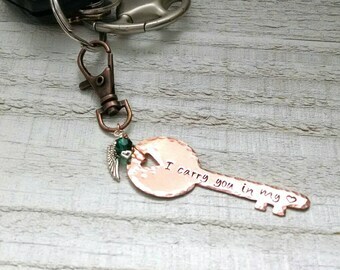 I will be happy to add a name and date to this keychain, just leave me a message in the "note to beccasblues" box at checkout with the name and date you would like stamped onto your heart. Each heart is hand cut and stamped by me. Heart measures approximately 2" x 2", each will vary slightly in size and shape since they are cut by hand. I hand stamp "I carry you in my heart" and add an angel wing and a Swarovski Elements birthstone bead of your choice. Words are oxidized to darken them and make them stand out. Clips to keys or zipper with a copper clip which measures 1 1/2", total length with heart is approximately 4". Lovely item, arrived quickly and was packed well. Becca's Blues did a beautiful job on my order, personalizing each item to make them even more special. I was also blown away at how the items were packaged for delivery. They came in little white boxes with very pretty bows and were carefully placed in extra padding to ensure their safe arrival. I was able to turnaround and send them out to my family in another state just as they came and be proud of how the gift would look when it arrived. Thank you so much for making such a wonderful set of tributes for my aunt! The communication and quick turnaround were fantastic! This is a beautiful piece of jewelry. Her extra touches mean the world for the people that receive this gift.